Ok... so I was running little late yesterday afternoon, Oct. 30, 2011, 3:45-4:00 p.m. and decided to run over to a spot close to my house that has produced some "Biggins" in the past. The property is split by my buddies long driveway which overlooks half of the property. As I get up to the top I start having second thoughts and decide to leave and hit another spot down the road. When I get half way down the driveway something tells me to climb near a stream that cuts through the north side of the property. So I stop my truck, throw it in reverse and back up the driveway I go. This spot by the stream I've never hunted before, but have scouted it pre season and it looked pretty good. So, I get dressed, climber on my back and the ol' stick and string in hand. As I make my way through and get to the spot, I can't find any trees to climb so I start heading up this ridge away from the stream. With the soft snow cover and a good cross wind I decide to keep going up the ridge to a really nice acorn flat. After about 15 minutes of slowly walking I reach the flat, which is covered in white and red oaks (not one with acorns on them). Now I'm doing the 360 degrees "picking a tree" dance. As I turn to my left, out of the corner of my eye...WHAM!... I catch RACK moving about 150 yards down the other end of the flat. I hit the ground and start stripping off gear. I get my bow loaded, bino's and range finder and slowly stand back up glassing. The buck looks to be a 115-120 inch 8 point raking a tree and making a scrape. Now Im trying to figure out how to close the distance with out him busting me. I slowly start working my way towards him trying to keep the big old oaks between me and his eye balls. I close the distance to about 70 yards and reach a point where I have to go over a big Oak tree that had fallen and a large rock. As I'm sitting there staring at what appeared to be a "mountain of madness" I had to get over...WHAM!... I catch another set of antlers raking some hanging branches on a small tree. This ol' brute has a huge body compared to the first 8-point and from what I can see, the rack surpasses him as well. Now mind you, I'm sitting out in the open, have to get over this obstacle and try and get to another big Oak tree without spooking these two. I go for it as they are preocupied with each other and the brush their thrashing around. Over the tree, slide down the rock and right onto my rear end! I froze...I slowly pick up my bino's and thank God they didn't catch any of that circus act, hahaha. I'm now withing about 60 yards of these two and making my way to a big Oak tree 10 yards in front of me. As I'm making my way to the tree, the smaller of the two walks behind a thicket and dissapears. With only one set of eyes to worry about now, I make it! I practice pre season all the way out to 70 yards but never would take a 70 yard shot in the woods, but a 50 yarder??? You bet your sweet @#!%! I set up behind the tree and start glassing and ranging the openings I have. Everything to the left of him and right of him starts at about 47 yards and beyond. The best shooting lane I have is to my left and my range finder reads 50 yards. Now Im trying to see where this big boy is going to walk to and of course with my luck, he beds down. At my angle I can only see the end of his right beam, his nose and a G2 on the left side. His head is behind a Maple tree and through the thick stuff I can make out his hind quarter. What do I do? Do I grunt to him? Do I snort wheeze? Use the can? I'm also contemplating crawling closer to him, but realize as soon as I break the cover of this tree he will be able to see me. So I sit...and I sit...for about an one and a half hrs. Finally, he stands up and just sits there checking out everything. After about five minutes he starts to move. YES... right toward my opening on the left. I go to full draw as he continues down that trail, he gets into my hole and I try and stop him, he doesn't stop and continues on his path. Still at full draw Im trying to find another hole in the branches. I find one 10 yards ahead of him and he starts to quarter away from me and head up the hill. He reaches the hole i picked... "MEART", he turns and stares right at me. I lay the 50 yard starvation bead on him and hold for a good ten seconds...then let it fly. The green lumenok lights up the air and WHACK! The arrow had good penetration, but when he took off I could see it loosely dangling out of him. It looked like a good hit but you know your mind starts to play tricks on you and I soon think I hit him too low and too far back. He got out of sight and I heard some crashing and then the woods went quiet. I texted a buddy of mine and about 5 minutes later I hear what sounded like the buck crashing down. All jacked up and freaking out I sneak out of the woods and back to the truck. My buddy tells me to go home and he will meet me there. We muster up at my house and talk about the shot. We give him about 2 1/2 hours and decide to head in with lights and check the hit location. Well, to make a really long story longer... hahahaha... We found a great hit location, great blood and this big ol' brute laying about 45 yards from where I hit him. The shot was perfect, the arrow entering him slightly quartering catching the edge of the liver and right through the heart poking out his opposite armpit. Im super pumped!! 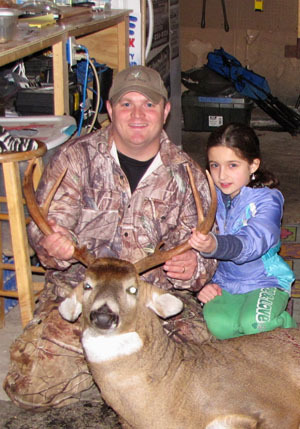 Joe's buck was taken near Newburgh, N.Y. in Orange County and green scored around 110.